"Plimsoll line" redirects here. For the use of the Plimsoll symbol in chemistry, see Standard state. For other uses, see Waterline (disambiguation). The purpose of a load line is to ensure that a ship has sufficient freeboard (the height from the water line to the main deck) and thus sufficient reserve buoyancy. The freeboard of commercial vessels is measured between the lowest point of the uppermost continuous deck at side and the waterline and this must not be less than the freeboard marked on the load line certificate issued to that ship. 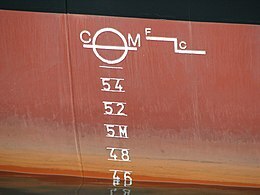 All commercial ships, other than in exceptional circumstances, have a load line symbol painted amidships on each side of the ship. This symbol is also permanently marked, so that if the paint wears off it remains visible. The load line makes it easy for anyone to determine if a ship has been overloaded. The exact location of the load line is calculated and verified by a classification society and that society issues the relevant certificates. This marking was invented in 1876 by Samuel Plimsoll. The first official loading regulations are thought[by whom?] to date back to maritime legislation originating with the Kingdom of Crete in 2500 BC when vessels were required to pass loading and maintenance inspections. Roman sea regulations also contained similar regulations. In the Middle Ages the Venetian Republic, the city of Genoa and the Hanseatic League required ships to show a load line. In the case of Venice this was a cross marked on the side of the ship, and of Genoa three horizontal lines. The first 19th-century loading recommendations were introduced by Lloyd's Register of British and Foreign Shipping in 1835, following discussions among shipowners, shippers and underwriters. Lloyds recommended freeboards as a function of the depth of the hold (three inches per foot of depth). These recommendations, used extensively until 1880, became known as "Lloyd's Rule". In 1966 the International Convention on Load Lines was concluded in London which re-examined and amended the 1930 rules. The 1966 convention has since seen amendments in 1971, 1975, 1979, 1983, 1995 and 2003, none of which have entered into force. The original "Plimsoll mark" was a circle with a horizontal line through it to show the maximum draft of a ship. Additional marks have been added over the years, allowing for different water densities and expected sea conditions. Letters may also appear to the sides of the mark indicating the classification society that has surveyed the vessel's load line. The initials used include AB for the American Bureau of Shipping, BV for Bureau Veritas, CN for Conarina, GL for Germanischer Lloyd, IR for the Indian Register of Shipping, KI for Biro Klasifikasi Indonesia, LR for Lloyd's Register, NK for Nippon Kaiji Kyokai, NV for Det Norske Veritas and RI for the Registro Italiano Navale. These letters are approximately 115 millimetres in height and 75 millimetres in width. The load line length is referred to during and following load line calculations. For the purposes of loadline marks, fresh water is considered to have a density of 1,000 kg/m3 (62 lb/cu ft) and typical sea water 1,025 kg/m3 (64 lb/cu ft). Fresh water marks make allowance for the fact that the ship will float deeper in fresh water than salt water. A ship loaded to her fresh water mark in fresh water will float at her summer mark once she has passed into seawater at the same displacement. Similarly if loaded to her tropical fresh water mark she will float at her tropical seawater mark once she passes into seawater. The summer load line is the primary load line and it is from this mark that all other marks are derived. The position of the summer load line is calculated from the load line rules and depends on many factors such as length of ship, type of ship, type and number of superstructures, amount of sheer, and bow height. The horizontal line through the circle of the Plimsoll mark is at the same level as the summer load line. The winter load line is one forty-eighth of the summer load draft below the summer load line. The tropical load line is one forty-eighth of the summer load draft above the summer load line. cannot be ascertained the fresh water load line is at the same level as the tropical load line. The position of the tropical fresh load line relative to the tropical load line is found in the same way as the fresh water load line is to the summer load line. The winter North Atlantic load line is used by vessels not exceeding 100 metres in length when in certain areas of the North Atlantic Ocean during the winter period. When assigned it is 50 millimetres below the winter mark. Certain vessels are assigned timber freeboards, but before these can be assigned certain additional conditions have to be met. One of these conditions is that the vessel must have a forecastle of at least 0.07 the length of the vessel and of not less than standard height, which is 1.8 metres for a vessel 75 metres or less in length and 2.3 metres for a vessel 125 metres or more in length with intermediate heights for intermediate lengths. A poop or raised quarter deck is also required if the length is less than 100 metres. 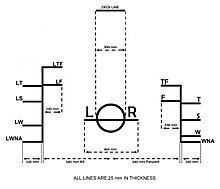 The letter L prefixes the load line marks to indicate a timber load line. Except for the timber winter North Atlantic freeboard the other freeboards are less than the standard freeboards. This allows these ships to carry additional timber as deck cargo, but with the facility to jettison this cargo. The summer timber load line is arrived at from the appropriate tables in the load line rules. 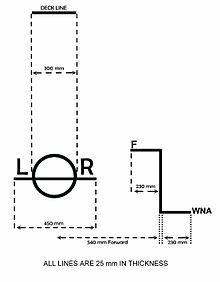 The winter timber load line is one thirty-sixth of the summer timber load draft below the summer timber load line. The tropical timber load line is one forty-eighth of the summer timber load draft above the summer timber load line. The timber fresh and the tropical timber fresh load lines are calculated in a similar way to the fresh water and tropical fresh water load lines except that the displacement used in the formula is that of the vessel at her summer timber load draft. If this cannot be ascertained then these marks will be one forty-eighth of the timber summer draft above the timber summer and timber tropical marks, respectively. The timber winter North Atlantic load line is at the same level as the winter North Atlantic load line. Passenger ships having spaces which are adapted for the accommodation of passengers and the carriage of cargo alternatively may have one or more additional load line marks corresponding to the subdivision drafts approved for the alternative conditions. These marks show P1 for the principal passenger condition, and P2, P3, etc., for the alternative conditions; however, in no case is any subdivision load line mark placed above the deepest load line in salt water. ^ C. Ernest Fayle (November 2005). A Short History of the World's Shipping Industry. Routledge. p. 29. ISBN 978-0-415-38163-5. Retrieved 20 July 2013. At Venice, an official mark was placed on the outside of the hull, and the ship was inspected before she sailed. If the mark was found to be more than a specified depth below the water-line, the excess cargo was removed by the authorities and the owners heavily fined....Thus, we have here a foreshadowing not only of Plimsoll's Mark but of the classification of shipping. ^ Boisson, Philippe (1999). Safety at Sea: Policies, Regulations & International Law. Paris: Bureau Veritas. pp. 45–55. ISBN 978-2-86413-020-8. Retrieved 20 July 2013. The very first regulations appeared in Venice in 1255. They made it illegal to exceed the draught, marked on each ship by a cross. Similar provisions were to be found in Cagliari and Pisa at the same period, and also in Barcelona, in the decree issued by Iago de Aragon in 1258, and in the maritime statutes of Marseilles in 1284. The most elaborate regulations appeared in the 14th-century Genoese statutes. ^ Augustin Jal (1848). Glossaire nautique: Répertoire polyglotte de termes de marine anciens et modernes. Bottega d'Erasmo. pp. 508–. ^ Augustin Jal (1840). Archéologie navale. A. Bertrand. pp. 262–. ^ See Nicolette Jones, The Plimsoll Sensation. The Great Campaign to Save Lives at Sea, London, Little, Brown, 2006. ISBN 0-316-72612-5. Wikimedia Commons has media related to load line.